The Source Water Protection QuickBird Imagery Project constitutes a high-resolution satellite imagery data set for approximately 120,000 km2 in the Province of Ontario. This data consists of orthorectified image derivatives from the Level Basic-1B bundled imagery provided to the Ontario Ministry of Natural Resources (OMNR) by Digital Globe, Inc.
Pansharpened images (60 - 70 cm true colour composites) are required for mapping applications that require high-resolution background imagery. Additional image derivatives, such as enhanced Multispectral and Greyscale (Panchromatic) products (GeoTIFF and MrSID formats) may also be generated depending on requirements. Raw (Basic-1B) imagery was secured from Digital Globe to ensure that the orthorectification process could be conducted under the supervision of OMNR staff, with an adherence to the geospatial standards of the Natural Resources Values Information System (NRVIS). The purpose of the Source Water Protection QuickBird Imagery Project is to establish a high-resolution imagery dataset for a large portion of Source Water Protection (SWP) priority areas currently void of such imagery. QuickBird imagery, with a panchromatic resolution of 60-70cm and multispectral resolution of 2.4-2.8 m is an achievable, cost-effective substitute for high resolution orthophotography (20-50 cm) which either exists or is imminent in the remaining portions of the SWP Priority areas. The raw imagery provided by Digital Globe, Inc. was used as the source information from which orthorectified, pansharpened, enhanced and compressed satellite imagery scenes were generated. The QuickBird multispectral and panchromatic bundled imagery was provided by Digital Globe in Basic-1B format (16-bit GeoTIFF). The Ontario Ministry of Natural Resources undertook a processing workflow to generate derivative products. These processes included orthorectification, pan sharpening, scaling (16-bit to 8-bit), linear enhancement and the generation of compressed (MrSID) products. All derivative products generated during the process have been retained. These include the following: Orthorectified Multispectral Imagery (16-bit); Orthorectified Panchromatic Imagery (16-bit); Orthorectified Pan Sharpened Imagery (16-bit);Orthorectified Multispectral Imagery (8-bit);Orthorectified Panchromatic Imagery (8-bit); Orthorectified Pan Sharpened Imagery (8-bit); RGB and CIR Composite Multispectral Imagery (8-bit PIX,GeoTIFF and MrSID); Greyscale Panchromatic Imagery (8-bit PIX, GeoTIFF and MrSID); RGB and CIR Composite Pan Sharpened Imagery (8-bit PIX,GeoTIFF and MrSID). 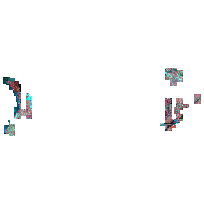 The pixel values contained within each QuickBird image are accurate representations of spectral signatures of ground conditions at the time of capture. Atmospheric conditions, sun illumination angle and nadir angle of the satellite will have some impact on the radiometric values represented in these images. Pixel values of enhanced (Linear stretches) and compressed (MrSID) image derivatives are not directly representative of radiometric values but rather visually enhanced representations of ground conditions. On-going Seasonal Data Collection (April to November) Anticipated Ending Date is November 2007.